A detailed account of Gaga's rise to fame, from her early life when she was known as Stefani Joanne Angelina Germanotta, through to her super-stardom. It begins with her birth in 1986, covers her time at Convent of the Sacred Heart in New York, her early quests to nightclubs with... read full description below. A detailed account of Gaga's rise to fame, from her early life when she was known as Stefani Joanne Angelina Germanotta, through to her super-stardom. It begins with her birth in 1986, covers her time at Convent of the Sacred Heart in New York, her early quests to nightclubs with her mother to perform at open-mic events, and her brief foray into the Tisch School of the Arts. Germanotta took on the name Lady Gaga from the song by the rock group Queen called Radio Ga Ga ; she released her first album The Fame in 2008. Lady Gaga describes the musician's success in the industry, noting her business collaborations and appearance on the cover of Rolling Stone in 2009. 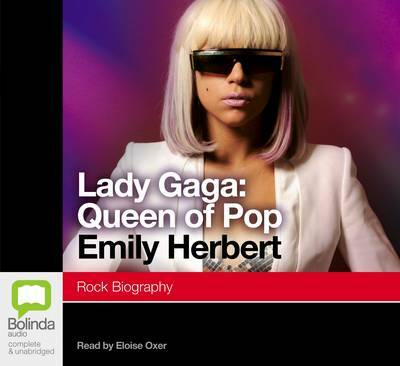 Emily Herbert is a highly successful journalist and author. Having written for a host of newspapers and magazines, she has a unique insight into the lives of the stars and the inner circle of celebrities. Emily lives in West London. Since her acclaimed debut in the Sydney Theatre Company's 2002 production of The Glass Menagerie, Eloise has worked with the STC, the MTC, Racing Pulse and numerous independent theatre companies Australia wide. An avid reader, her Bolinda audiobook titles range from Ted Prior's kids classics to Peter Carey's literary fiction. Screen credits include Oddball, Hunt Angels, and the ABC's The Cut, My Place and The Doctor Blake Mysteries.